In last few weeks have been an absolute blur for us. We'll soon be moving from Mumbai where both my husband and I were born and brought up to Sydney, Australia. We were so excited when our paperwork came through and since then things in our home have been absolutely crazy. With travel arrangements, shopping, packing and selling off things we're not taking, I've hardly had any time to focus on cooking. This month I was assigned Jackie's blog Rediscovering Lost Arts From Our Mothers. This blog was new to me and I was thrilled to see the ideology behind it. I agree with Jackie all the way, there's so much we're missing out on in the form of tradition, practices and culture all because of the convenience of today's world, where were always in a hurry, short of time and running. You should stop by Jackie's space and check it out, she's got loads of recipes on canning, smoking, preserves and wonderful home cooked goodness. To my absolute delight, that not all she has. Even though I didn't have much time, I managed to make 2 recipes from her blog using stuff that I had in the pantry. 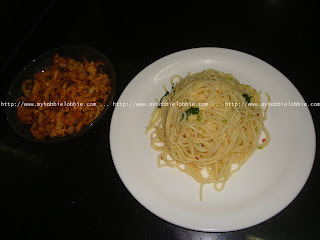 I've always wanted to try Spaghetti Alio Olio after watching David Rocco make it on his cooking show. This seemed like the perfect opportunity since Jackie has a version of it on her blog and while I was going through her space, I noticed a post on Onion straws. Like her I love me some onion. Whether is onion rings, sauteed onions, onions in a salad or these onion fritters, I love cooking with onion and enjoy eating it in its many different forms too. I was intrigued by her recipe and it seemed simple and quick enough for me to try. Both these dishes came together so quickly and can I tell you, they were both yummy. The spaghetti was simple but so flavorful. I loved it. The onions straws, may I add, was an absolute hit. I had a hard time keeping my husband away from it long enough to get pictures. There are crisp, delicious and very addictive. They'd be a fantastic addition to some grilled or roasted meat, but I think they make for some very yummy party munchies too. The only thing I'd do differently next time is use larger onions. These ones were rather small so the onion straws don't particularly look like straws, but were delicious nevertheless. In all I was very happy with the way both recipes turned out. Thanks Jackie, for introducing me to these yummy treats. The only changes I made was I used fresh coriander instead of parsley since that is what I had on hand and I upped the garlic content. I love garlic and if you don't please remember to cut down on the quantities mentioned. In a small pan, add the oil and butter and the garlic and saute for a few seconds on medium low heat till the garlic releases flavor and aroma. Add the red pepper flakes and pepper and saute for a few seconds more. Make sure the garlic doesn't brown, else its burnt and will be slightly bitter. Add this back to the pasta and place on the stove for a little while on low heat. Toss the pasta well and make sure the oil and herbs are evenly distributed. Add the chopped coriander and toss well. Serve hot. Peel and slice the onions and soak it in the buttermilk. In the meanwhile, add the salt, pepper and red chilly powder to your flour and mix well. 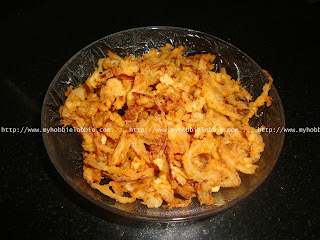 Shake off the excess buttermilk from the resulting onion straws and dredge it in the flour mix. Carefully place it in the oil and deep fry till golden brown and beautifully crispy. Thank you Jutta (Hungry Little Girl) for hosting this fun event month after month. Its been a blast. If you'd like to join in on the fun, click here. Hope your move goes smoothly! The blog is great! These both sound delicious!! Great picks! Thanks Anyonita and I'd love to participate in the linky party. Thanks for the invitation. Good luck with the move, Trisha.